The 2022 Commonwealth Games will no longer be held in Durban, South Africa. David Grevemberg, chief executive of the Commonwealth Games Federation, said the city did not meet the criteria set by his organisation, and the search for a new host city had already begun. Durban was awarded the Games in September 2015 and was due to be the first African city to host the event, which was first held in 1930. Liverpool and Birmingham have expressed interest in staging the 2022 edition. The Commonwealth Games are held every four years and feature athletes from more than 50 countries, mostly former British colonies. 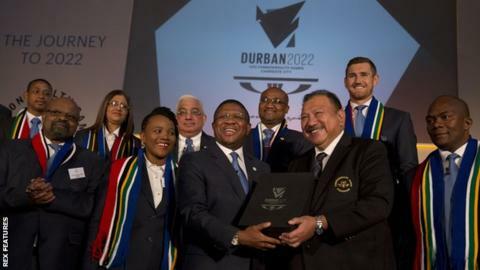 Last month, South Africa's sports minister Fikile Mbalula indicated Durban may not be able to host the 2022 event because of financial constraints. "We gave it our best shot but we can't go beyond. If the country says we don't have this money, we can't," he said. Grevemberg said: "We are disappointed but it does not diminish our commitment to the African continent. "We have had to postpone these ambitions to a later time. We all share disappointment that this ambition needs to be postponed right now. "We remain committed to the inspiring potential of a Games in the continent." Grevemberg said the South African government had never signed off on the decision for Durban to host the Games. "We have a host city contract," he said. "It was signed by all parties on the day except for the South African government. "We have engaged with the government to really try to work with their current circumstances but also uphold the commitments that were outlined in their bid. They were unable to do that at this time and we have had to look after the citizens and communities that our events serve." Grevemberg said an announcement on a new host city would be made by the end of the year. "Discussions with a number of interested parties are under way," he said. "I am confident an alternative host city will be found and that we will have an inspirational Games for the athletes and fans across the Commonwealth." A spokesperson for Liverpool City Council said: "We had heard rumours that Durban might be unable to deliver the Commonwealth Games in 2022 and have already indicated to the government that we are very willing to host them instead." Birmingham had already expressed an interest in hosting the 2026 Games. Councillor Ian Ward, deputy leader of the city council, said: "We are aware of the decision from the Commonwealth Games Federation to seek a new host for the 2022 Games. "Here in Birmingham we are already in the advanced stages of producing a detailed feasibility study on what would be needed for a truly memorable Games in the city. "That is due to be completed in the coming weeks and we are in close contact with the government about the developing situation."